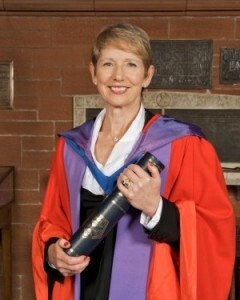 Frances McMenamin QC has received an honorary degree from the University of Strathclyde. The leading advocate was made a Doctor of the University at Strathclyde’s Barony Hall during the annual University Day celebrations. She was recognised for her outstanding contribution to the legal profession, as well as her work as a lay member of the University’s governing Court and a member of the University’s Law Clinic Management Committee since its inception. Dr McMenamin’s oration was read by Professor Kenny Miller, Vice- Principal of the University, who described her as a great supporter of the Strathclyde Law School, a great ambassador and an incredibly hard worker who had brought great distinction to the University.